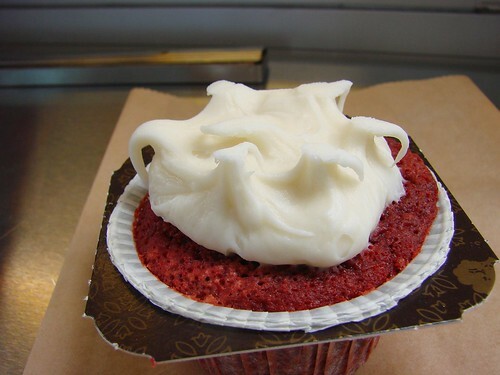 Midtown has a few red velvet cupcake options, but the ones from the Street Sweets trucks are the best I've had so far, handily beating out Magnolia's too dry Red Velvets and the too expensive Red Velvet cupcakes from Dean and Deluca. The cream cheese frosting here is sweet but it had a nice tangy finish. And the cake was moist yet toothsome with just the right amount of cocoa. Certifiably delicious. I'll definitely be getting these again. Follow Street Sweets on twitter for updates on their daily location. Oh my god, that frosting is so alluring! Those little dollops just beg to be eaten right off. How do you get it out of that weird cardboard contraption? I had one on Monday... good flavor, but it wasn't soft or moist and seemed over-baked. Perhaps a fluke? It does seem like it could be a really great cupcake. I tried one on Thursday - it was good but not great. The frosting to cake ratio was very low (less than in the picture), and the cake was just a bit dry. Congrats to the Sofi Winners! Katchkie Farm Comes to the Port Authority! 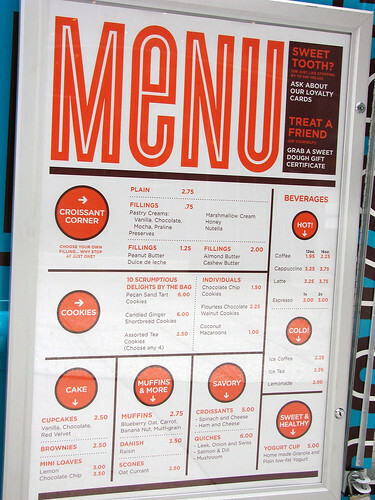 Mobile Food Alert: Street Sweets hits Midtown!